Home	→ Blog → LACE FRONTAL WIGS → How many kinds of density full lace wig? Welcome to the world of hair – Layla Hair! in recent years, full lace wig is becoming the hot trend of ladies all around the world. In order to meet customers’ demand, Layla Hair has developed the range of full lace wig with different color, thickness, … because of its convenience as well as outstanding features. The density of full lace wig is one of the most important factors when you make a decision to buy one. The ideal one – 130 density full lace wig – is also revealed in today’s post. Let’s discover right now! Nowadays, full lace wig have an extensive coverage with women. Customer concern and buy a full lace wig in market and ,of course, they know how great full lace wig is. However, most of them don’t know the details of products they buy, especially the density of them! Do you know how many kinds of density full lace wig? 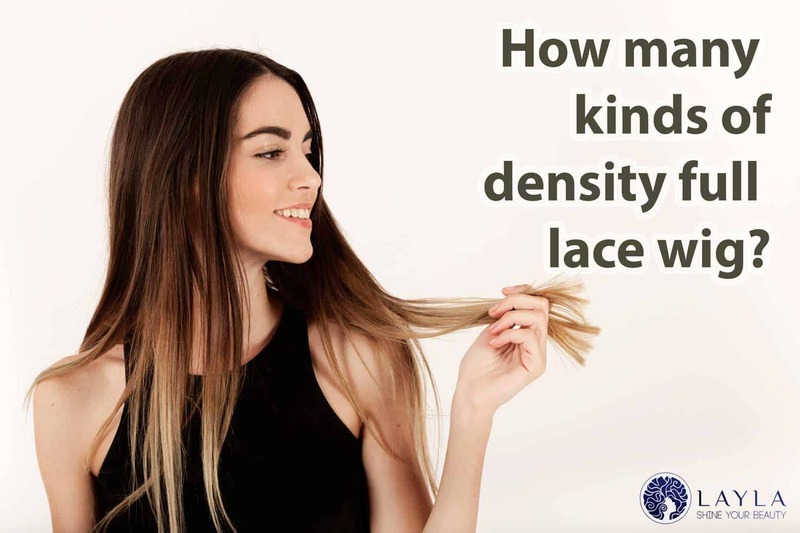 What is 130 density full lace wig? Why is it perfect for you? Today, we are here with you so as to help you answer these questions! Full lace wig is created by a lace cap which covers the entire head and the 100% real hair knotted into by hand. On typical full lace wigs there is a strip of stretch lace over the top of the crown to allow your natural hair development beneath or variations in head size. Because of having cap made from lace, the color and the material of it blend well with the head skin’s color. Therefore, full lace wig is easy to install and suitable for you in many cases. You are able to wear it anywhere that you want without detection that you are wearing a wig. Beside the variety of color and length, density of full lace wig is one significant factor which is considered carefully. Have you ever hear about 130 density full lace wig? Also, you have ever wonder about the number 130? What is that? It is one of the kind of density full lace wig. Now let’s go to the next part! The hair density you buy totally depends on your personal choice. However, most of customer’s choice is medium density or light to medium density. Stock Density – 130 density full lace wig is one of kinds density full lace wig make them have a natural look. With ladies, who suffer from bald or alopecia, the heavy density is the optimal choice. In the next passage, I will help you how to identify the density full lace wig particularly. How to identify the density full lace wig? Hereafter, let me analyze each density full lace wig with some pros-cons of them to have comprehensive view of full lace wig. 90 density full lace wig: is for those who want their hair to appear very light and thin. However, it is not a optimal choice, because with this density, hair will be bald very quickly. You will pay an extra money to buy new one soon. 100 – 110 density full lace wig: is for people who have natural thin hair and they want to add the amount of hair having similar texture as their natural texture. The only drawback of this density is that there will not be a lot of hair on the cap. 120 – 130 density full lace wig: is a genuine looking density; it is not too thick, not too thin. This is a perfect option because it nearly doesn’t have any demerit. The hairline with a light density then a slight thicker density bring a natural look and appearance to ladies. 150 density full lace wig: A great density for girl who want a little added fullness to strengthen the nature of hair. 180 density full lace wig: for persons who desires full and voluminous hair look, especially longer lengths. 200 density full lace wig: is usually ordered by ladies who want their hair to look extra glamorous and mostly used it for special occasion and place such as theatre, costume wear and shows. Please note that: Now, our best seller is 130 density full lace wig because obviously, 130 density full lace wig have outstanding advantages more than others. Nevertheless, you customize your density by contact us and order what you need. Purchasing a full lace wig is not difficult, but choose a proper one is not easy. If you love 130 density full lace wig or any kind of full lace wig, contact us to order and receive enthusiastic consultation from Layla Hair’s staffs. Let’s call at our website(http://laylahair.com) or connect with us through WhatsApp((+84) 989 633 424 ) to find out full lace wig more!